The scale of the defeat in Westminster of Theresa May’s UK/EU withdrawal deal, by 432 votes to 202, was devastating. According to the Daily Telegraph it was a “complete humiliation”. The Guardian referred to it as a “historic defeat”, while the Mirror summed it up with “No deal; no hope; no clue; no confidence”. The deal was only supported by 13% of people in Britain. Yet, the following day, the “zombie administration”, as Jeremy Corbyn dubbed it, survived a vote of no confidence by 325 to 306 votes, with the support of 117 Tory MPs who had backed a challenge to May’s leadership in December. Importantly, the DUP also lined up behind the government. The EU establishment are not sympathetic to the UK government’s plight, with Michel Barnier asserting that the deal was the “best compromise” on offer. It is possible that, in order to avert a serious crisis, Article 50 is extended, i.e. the Brexit can is kicked a little down the road in order to allow further negotiation. 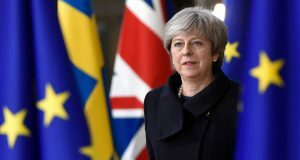 It is also possible that the government – particularly given the hard-nosed approach of the EU – will go for a softer Brexit, with all of the UK staying in the customs union and the single market (known as the Norway option), something for which a section of pro-remain Tory MPs and Blairite Labour MPs have been pushing. Even the DUP are open to this. Despite Labour MPs voting ‘no confidence’ in the government, the real attitude of the Blairites can be seen in the comments of John Woodcock, an MP who lost the whip due to allegations of sexual harassment and who abstained on the vote of no confidence. He stated that Corbyn “is as unfit to lead the country” as May. The civil war inside the Labour Party hasn’t gone away. The focus of the Blairites is to push, not for a general election, but a so-called “people’s vote”. This is a very risky option for the capitalist class. It would be seen as an attempt to reverse a decision they didn’t like. It would be highly divisive and would risk a further undermining of the already diminished authority of the political establishment. Socialists do not back this option because none of the options on the ballot would be in the interests of the working class. Instead, Corbyn and the Labour movement must take advantage of the Tories’ weakness and organise mass, working-class action to demand a general election, and fight for a left government which can negotiate a new deal in the interests of the 99%. Alongside this, ‘trigger ballot’ processes must urgently be begun to allow local Labour parties to democratically remove the Blairites and select candidates of the left who will back Corbyn’s leadership and anti-austerity policies. It is crucial to avoid “the false choice of a bad deal versus no deal,” as Unite General Secretary Len McCluskey put it. This should be the starting position of the movement as a whole. The Brexit deal on the table is not in the interests of working-class people but of the capitalist class in Britain and Europe. The deal would mean that the neo-liberal straight-jacket of EU rules would continue to apply. These rules effectively rule out many of Corbyn’s policies by, for example, putting limits on state aid for postal services, for broadband, for railways and for airports. The deal also rubber stamps attacks on migrant and refugee rights by both the EU and UK governments. On this basis alone, socialists must oppose the current deal. There is another reason, however. Socialists have a responsibility to oppose any measure which would heighten sectarianism in Northern Ireland. The deal that was rejected in Westminster contains a backstop which, if no alternative trade deal can be negotiated, allows for extra non-customs checks between Northern Ireland and Britain in two years time. In other words, an “East-West” border could begin to emerge as early as December 2020. This would add to the insecurities felt about the future by many ordinary Protestants. If there is a perception over time that their identity and the integrity of the Union is being diminished, it could provoke a serious reaction, as we have seen in the past. It is not simply a question of the DUP, but the concerns and fears of ordinary, working-class Protestants. Equally and conversely, the rejection of this deal does put the issue of a “no-deal” Brexit on the table. In that situation, the EU and the Irish government will have to decide what happens at the border. After a no-deal Brexit, the logic of the workings of the EU is that a hard border would have to be put in place, and even the possibility of this is causing anger in the Catholic community. Border posts, customs posts, any physical manifestation of a hard border would become symbols of a denial of the national aspirations of the Catholic population and would not be accepted in any way. 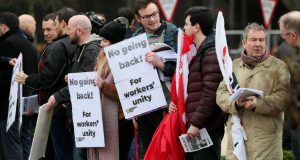 In this situation, the trade union movement – with its 800,000 members in Ireland and six million members in Britain – has a historic responsibility to take up the gauntlet and offer an alternative. In an article in the Newsletter, Owen Reidy of NIC-ICTU (the co-ordinating body of trade unions in Northern Ireland) calls for the establishment of a “Northern Ireland Brexit Stakeholder Forum” involving unions, farmer organisations, the community and voluntary sector and “key business groups.” The interests of workers and these “key business groups” are not compatible. For example, a former spokesperson of IBEC (the Irish bosses’ union) called for the “imposition of pay freezes as an emergency measure” because of Brexit. Why should trade unionists form a stakeholder forum with them? Instead, the labour movement should organise its own conference, representing workers across Ireland and Britain. The Irish Congress of Trade Unions (ICTU) should take responsibility for the convening of a conference along these lines. If ICTU doesn’t face up to its responsibility, then a coalition of the trade union bodies prepared to do so should take the initiative. Such a conference should discuss how the economic interests of the working class in Ireland and Britain could be defended against those who wish to use Brexit to attack workers’ rights and conditions, including the possibility of coordinated industrial action. It would also have to discuss how we can defend the unity of the working class in the context of Brexit, preparing to counter any increase in sectarian tension and conflict with protests, demonstrations and industrial action to challenge the sectarian forces. A conference of this kind should discuss how trade unionists and socialists could support the fight for a Corbyn-led government in Britain and the need to build mass, left parties of the working class in Ireland, North and South. A Corbyn-led government should seek to re-open negotiations and demand an entirely different relationship with the EU, including new trade arrangements which avoid any hardening of borders, based on the interests of working-class people, not the 1%. This means a rejection of any EU restrictions on the ability of a Labour government to reverse privatisation or nationalise key sectors of the economy. Such a government would have to speak over the heads of the European Commission and European governments, reaching out to working-class people across Europe in rejecting neo-liberal rules and popularising a socialist vision of Europe. The workers’ movement in Britain and Ireland should mobilise its resources to build a cross-Europe fight back. If Brexit threatens workers’ jobs or pay, taking enterprises into public ownership, under democratic workers’ control and management, should be the reaction of a left-led government. In that way, all jobs can be safeguarded and, if necessary, production changed to more socially needed products. 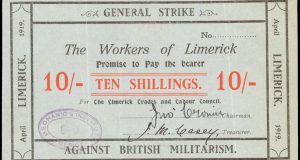 Ultimately, what is needed is a united struggle by working-class Catholics and Protestants for a socialist Ireland – with the full, democratic rights of both communities guaranteed – as part of a free and voluntary socialist federation with Scotland, England and Wales and a wider united, socialist Europe – a Europe run in the interests of the 99% not the billionaires.